BONO HAS LABELLED Donald Trump “potentially the worst idea that ever happened to America”. 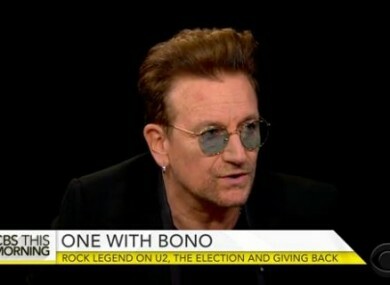 Speaking on CBS This Morning, the U2 frontman sharply criticised the Republican US presidential nominee. “America is like the best idea the world ever came up with, but Donald Trump is potentially the worst idea that ever happened to America,” Bono said. “It could destroy it because of what we’re saying, because America’s not just a country. Ireland is a nice country. Great Britain is a great country — all the rest of it. It’s not an idea. “America is an idea, and that idea is bound up in justice and equality for all — equality and justice for all, you know? Meanwhile, a member of the Kennedy family has claimed former US President George Bush Snr is going to vote for Hillary Clinton in November’s election. She told Politico she met the former president in Maine yesterday, where the famous Republican said he was backing Clinton. Email “Bono says Trump is 'potentially the worst idea that ever happened to America'”. Feedback on “Bono says Trump is 'potentially the worst idea that ever happened to America'”.